A digital signature solution that enables your customers to sign your online documents and forms electronically without them already having a digital signature or any hardware signing device. Up until now, signing electronically with a digital signature was predominantly only available to licensed subscribers of digital signature applications and not to external customers whom are required to sign digital forms and documents, once-off. This is largely due to the cost associated with digital signatures and “on the fly” digital signatures not being available to a person that is not identified and linked to an established digital signature account. With the new Cosign Collab service, you enable the customer to once-off sign the form or document electronically with a digital signature using the organisation’s license. The system establishes essential confidence and compliance in the signature with three key areas (the three I’s) when issuing the digital signature. Intent to sign is established through communication that requires action. Once the signer has opted by action to continue with the process, intent is established and the signing process is activated. The Identity of the customer is established through various electronic communication methodologies. Existing account holders’ data can also be used in our identification methodologies. A combination of Email and mobile OTP (One time password) technologies are used to grant access to the document and digital signature. After a user electronically signs the document with their issued digital signature, the content of the document is protected. If any changes are made to the signed document, the signature will no longer be valid. The validity of the digital signature and the integrity of the document can be verified by anyone using free Adobe PDF reader, no need for any additional software or licenses. Lets assume that you are a financial institution that requires a customer to fill out a form to apply for credit. There are generally three major processes that follows. The applicant fills out the form, prints a copy, signs it and scans it back before uploading or Emailing it. The organisation then processes the application and if successful a final agreement is drawn up that the applicant must sign. This is generally Emailed and the process of printing, signing, scanning and Emailing is repeated. In some instances the applicant is even expected to make his way into a branch to sign on paper. 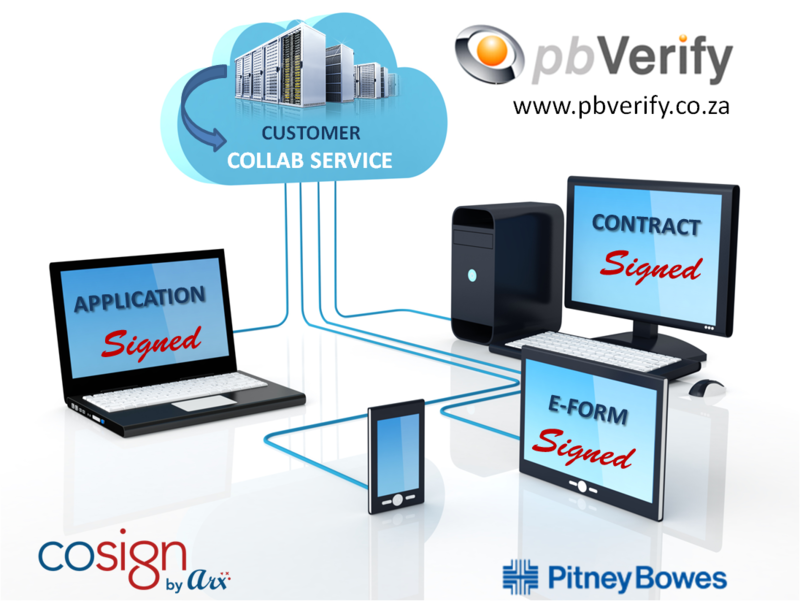 With pbVerify’s CoSign Collab, this entire process is digitised. No paper, printing, signing and scanning of the document and no need for the document to be emailed or uploaded at any stage. Please contact Leon van der Merwe on 011 516 9400 for more information or to book a product demo.